Testimonials – Allagash Guide Inc.
I’ve been going to the Allagash region for over 25 years, but had never done a river trip to the Town of Allagash. The opportunity came to join Blaine Miller, Allagash Master Guide and a party of 11 this past summer to paddle 96 miles of the Allagash Wilderness Waterway. It was one of the most demanding yet most enjoyable trips that I have ever been on. Allagash River offers spectacular views of lakes, rivers and streams and beautiful sunrises and sunsets. I was most impressed with Allagash Falls and the pristine waters of the Allagash Wilderness Waterway. Our meals were all cooked over an open fire. Breakfast included pancakes, bacon, sausage and eggs in the morning to salads, mashed potatoes, steaks, chops, fish and chicken for dinners in the evening, not to mention home-baked pies and cakes for dessert. No one left the table hungry. Most enjoyable for me were the cranberry muffin bread, pancakes and open-fire baker oven brownies. Miller offered stories on folk-lure and wilderness tips. He gave helpful suggestions on how to ‘read’ the river, and the proper way of paddling a canoe in rapids and flat water. His professionalism, concern for nature and pointers on being safe in the wilderness and on the water, helped make the trip most pleasurable and one that I will never forget. We have gone on an extended canoe trip with Blaine Miller / Allagash Guide for four years in a row; the St. John, the St. Croix, The Allagash and The Bonaventure in Canada. Every trip has been terrific. Blaine is a real outdoorsman and he provides us with great insight, equipment, delicious food [we gain weight every trip] and a real outdoor experience that shows us the beauty of the great North Woods. With Blaine’s help, we get better every day with our canoeing skills and we feel comfortable traversing the white water that we may encounter. We have taken both experienced canoeists and complete beginners on the trips and it is great to see everyone’s abilities improve every day. We have also fished very successfully with his guidance and have also seen our share of moose and other wildlife while on these adventures. We look forward to our yearly trips with Blaine and feel very lucky to have traveled with him. “WATCH OUT! !…rock right! “ As we navigate down a tricky rapid with our guide, Blaine Miller of Allagash Guide Inc, we are coached on proper “white-water” canoeing techniques and all is GOOD! My wife and I have been on several trips with Blaine; The Allagash Water Way, St. Croix River and the West Branch of the Penobscot. Each trip has had it’s own uniqueness and challenges but through it all Blaine has made the trips fun, safe and a good investment for our outdoor adventure dollar. You’ll hear him say (under his breath) to others along the way who may have gotten themselves ‘in trouble’, “should have hired a guide”. And he is right! Prepared…..there has never been a situation he hasn’t seen. We actually waited out a violent wind and rain event for 2 days, and ended up being the only canoes on the river because the Wardens knew Blaine had the situation under control!…PRICELESS! Great food…from a huge breakfast to steaks on the grill for supper, he does it all (well). Always well balanced, with desert! Story-teller/humorist…Blaine will surprise you with local lore and more. A dry funny person. Knowledgeable…Blaine will baffle you with his working knowledge of wildlife, geology and local history. Comfort (Outdoors? )….Blaine’s equipment and preparation makes his trips special and safe. 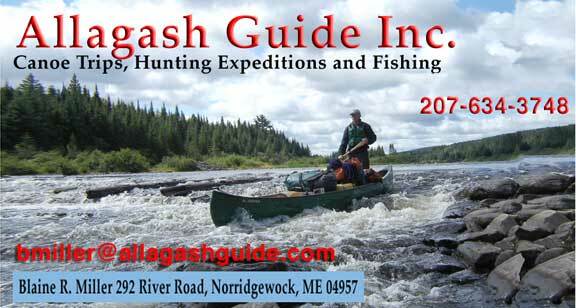 If you want an outdoor adventure in the Maine wilderness, Allagash Guide Inc. is the best way to go! In my experience over the past years I have not experienced any guiding service that provided as good or better guiding service for as low a price as Blaine does. In fact, on more than one occasion, I have argued with him about the fact that he should raise his prices; his service was worth far more than what he charged. However, he and his brothers’ upbringing with conservative Yankee parents have resulted in a great respect for price point and value. In addition, it is his specific goal to make his trips as affordable as possible; whether you are a single sportsman going on a Canadian wilderness adventure with him or an entire family canoeing down the Penobscot River, his trips and his service are truly a great value. If you are looking for a special wilderness experience, it will be truly a unique one at a great value and you can never do better than you would with Blaine Miller. I assure you, if you use his services once, it will not be the last time. Over the years I have introduced my sons, my family and friends and now my wife and I will very soon be introducing our grandchildren to these special wilderness adventures that Blaine provides. I’d be very happy to talk with or expand upon any of this with anyone who might wish further reference. I have to say Blaine looked at our group of 10 ladies with a smile and didn’t once question if we could do this trip! You see, we were all Midwestern City Girls and I’m sure we scared him with our polished nails, jewelry clad wrists and city clothes. We had so much fun! Him and Sylvia were the perfect guides and hosts! They can cook a mean breakfast , those pancakes were to die for! This trip was one of our favorite with scenery unmatched and wonderful guides to show us this part of America’s history. Loved the train but my favorite part was drinking crystal clear water coming right out of the mountain! Thanks again for a trip of a life time! Our company entertains clients from around the country with many types of outdoor activities. I can honestly say that Allagash Guide Inc. has over the years, provided the best of these experiences. From a trip down many of the states different waterways, to a team building management getaway, to exploring the Maine woods, hunting moose, deer, turkeys and upland game, we have used Blaine’s services for all. Many memories have been created around a campfire. I am proud to call Blaine a friend and a person who has taught me much about life through the outdoors.